Makeup and Modifieds: You are Allowed to Change. Sometimes I forget the immense magic that is held within the night sky. Honestly, I haven't remembered this in quite sometime - a few years actually. I couldn't tell you the last time I sat outside and just looked up. This is something I used to do all the time. I've always been so mesmerized by the stars; and by the moon. We get along well, like two old friends enjoying a night cap. I've been absent. From my conversations with the moon, a pen to paper, fingers to keyboard. Everything. Just complete absence. I blame this on my fight to be authentic this year. And now, I've realized something about being Authentic and allowing yourself to be just that. It's going to be different - Every. Single. Day. Because some days being authentic is just natural and it flows so effortlessly that you don't even know it's happening. And sometimes it's messy and complicated. Some times it's an uphill battle, a slow climb. no i'm not quoting miley cyrus. ok maybe i am. And sometimes when you feel like you've made it to solid ground, you fall flat on your face and roll all the way back to the bottom of that hill. But guess what? It's OKAY! It's going to happen, even to the best of us. Being Authentic is like the night sky. It changes. If you go outside and look up, one night the sky could be clear, full of bright stars, and a full moon. The next night could be cloudy with little to no stars. The night sky is forever evolving, just as we do. 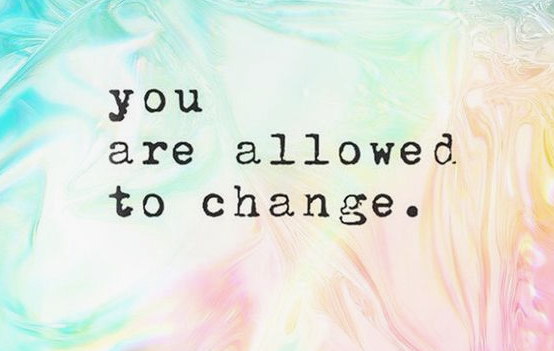 And the best way into being authentic is allowing these changes to happen in our every day life without trying to slow them down or make them come to a screeching halt just because it scares us or because someone else has a problem with it. You. Are. Allowed. To. Change. What a beautiful concept, right? I think so. I find power knowing that I'm allowed to be in a constant cycle of never-ending change. Because with change, comes evolving, and with evolving comes learning, and with learning comes growth. What a gift that is. I think the most important part about this is the word - YOU. You, Yes You, are allowed to have the power in change. Somewhere along the way we've learned that nothing good can ever come from change. On the other hand we've also learned that change can be a good thing - but at what cost? We fear change because we don't know what lies head for us and I think that we believe that because of what people have put into our heads: When You Change, You will lose yourself along the way. But I don't believe that. I think we find ourselves. And nobody else can change for you and nobody can tell you how to change or that you even have to change at all. Even though so many people try to tell you on a daily that you have to or that you have & they aren't okay with it. It's not their choice to make. And guess what, It's Okay because YOU are allowed! You are allowed to live in the most authentic way you know how, even if that means changing. As 2017 is winding down to it's final few months, I'm looking back to my year of Authentic. And boy can I say that I learned so much. I've allowed this change into my life, unapologetic to those around me and I've learned some really big lessons along the way. So much so, that I decided to go outside a few nights ago and just sit on our porch and look up. The clouds fill our mornings now but at night there are stars. Not as many now that we are going into the fall equinox, but just enough. Just enough to be reminded that change is still happening in our night sky, and within me. A sweet little reminder that I am allowed to change, every day.